More shares in my portfolio equals more dividends! What I try to do is continue to add every month no matter if the amounts are small or big. At the least each contribution I do will increase the future passive income I will receive. In this post, I will summarize how my portfolio has been doing in the last month. Today is August 15th and my portfolio sits at $383,000. The portfolio is generating $9713 in dividends every year. For me, 15% of this dividend will be taxed. My dividends are always immediately reinvested back into the company that paid them. This increases the level of compounding for each of my positions. All of my positions pay dividends, and all of them have increased them every year for many years which establishes a solid track record. I don't expect all of my holdings to continue increasing dividends forever. Some companies may fall and die but from the homework I have done, I believe that will be a rare occurrence. It is impossible to avoid any failures; however, I am confident the winners in my portfolio will more than cover for any losses from companies that go out of business. Nearly all of my positions are defensive. This means that the companies offer products and services we use everyday no matter the economic situation. I want to be part of a business that receives money from the regular consumer that will use the product on every occasion. My favorite companies are in the consumer staples business offering food, beverage, personal care, cleaning, and daily household item goods. I also favor utilities and healthcare as they offer products people will use even if the economy is bad. Defensive companies are more predictable, they offer more consistency in the dividend. I hold less industrials, no energy, and little materials stocks because they are volatile due to the nature of the economy or commodity prices. I hold quite a few consumer discretionary companies to diversify. However they are not my core holdings. 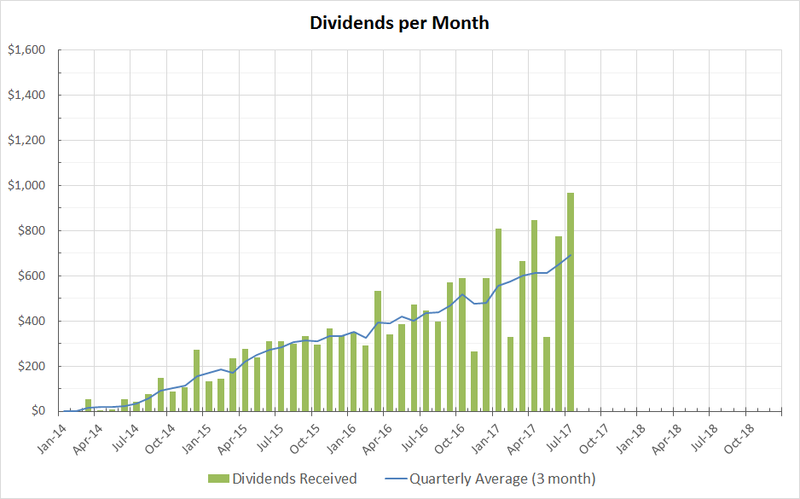 In July I collected a total of $967 in dividends. All of the cash received was reinvested back into the companies that paid them. The 1, 4, 7, 10 months are high paying months for me since I hold a lot of MO and PM in my portfolio. Below is the plot showing my the monthly dividends I receive. The 3 month average trend is a nice growth upward. Nearly all of this growth is due to my continuous contribution. By itself the portfolio is growing income around 10% annually. I zoomed out the chart for this month going forward since some of my plots were approaching the maximum dollar amount I previously set ($1000). I can feel that the snowball is starting to roll. Nearly $1000 in dividends in a month is an appreciable sum for me. My goal now is to my monthly moving average to cross $1000/mo. I hope in the future my dividends alone can pay for all of my rent or mortgage if I choose to purchase a property. That would make life much easier.